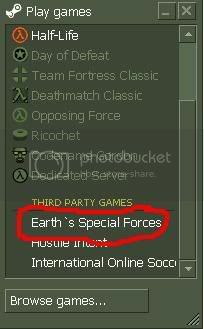 I JUST INSTALLED ESF 1.2.... THEN I ENTERED THE GAME.. I CLICKD ON EVERY SERVER BUT THEY KEPT GIVING ME THIS RETARDED MSG!! "YOUR CLIENT .DLL DOES NOT MATCH THIS OF THIS SERVER"
OK.. I DID.. WHAT NOW??? Calm down, don't double post. It's been SIX MINUTES SINCE YOU ASKED FOR HELP. Take a deep breath. After you installed 1.2.1 patch, then run ESF, and you shouldn't get that error anymore. 1. Since you installed the patch what happens? ANYWAY... I DL ESF1.2 & PATCH... NOW I HAVE THE PATCH DOWNLOAD ON DESKTOP.. WTF DO I DO NOW? Are you still getting the "client.dll" error when you try to connect to a game? 1. Take your finger OFF the shift key. I don't like helping disrespectful people. Notice how Half Life is not grayed because it's been run at least once and you have all the files needed for it.